The Property Buyers Hawaii website was outdated, wasn’t mobile-friendly, and included real estate listings from the MLS. 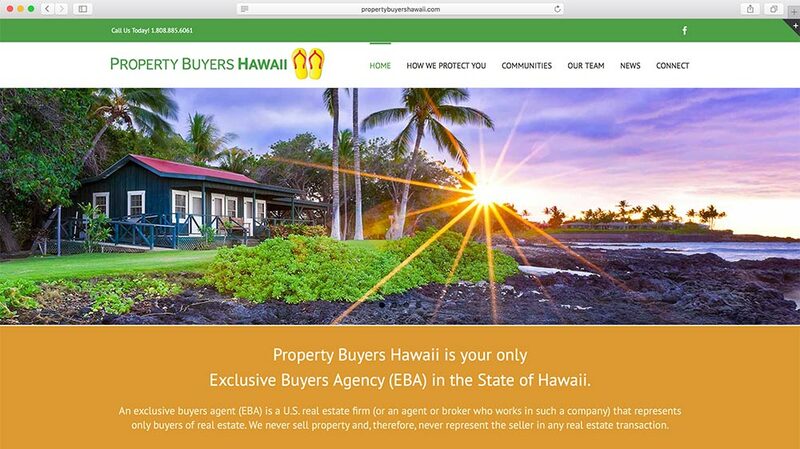 Bill Jardine, the Principal Broker for Property Buyers Hawaii, decided that he wanted his site to be all about his business of representing buyers only in real estate transactions, without the distraction and hard-sell of including listings on the site. He wanted the colors to be bright, the photos (by Ethan Tweedie) to be incomparable, and the message to be clear and concise. Bill is unquestionably sincere about his dedication to representing buyers, exclusively, in their real estate transactions. Bill knows Big Island real estate and he knows the pitfalls of “dual agency” where the agent for the seller represents the buyer too. Working with Bill Jardine is always great. From his extensive experience in real estate to his knowledge about the island (the people, the land, the history), to his creativity and sense of humor, Bill takes you on a journey you don’t forget.